The role of the farmer Kyūsaku originated in a play more than 300 years ago. It stems from actual events around the beginning of the eighteenth century that were then fictionalized for the kabuki and other theaters. 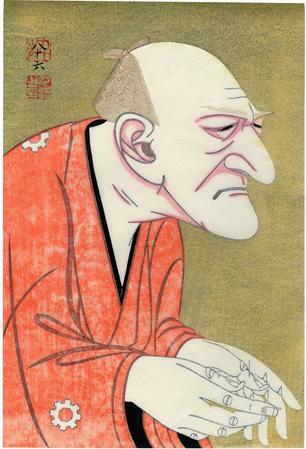 One of the only remaining elements which is still being performed today has the character of Kyūsaku in it in a peripheral role. The tragic deaths of Hisamatsu, an apprentice at the Aburaya pawnshop in Osaka, and Osome, his employer's daughter, have been the subject for numerous ballads and plays ever since the event occurred, supposedly in 1708. The first dramatization was a kabuki play, Love Suicides at the Devil's Gate (Shinjū Kimon Kaido), in 1710, to honor the third anniversary, by Japanese reckoning, of their deaths. Ki no Kaion's (1663-1742) puppet play Aburaya Osome of the White Tie-Dyed Sleeves (Aburaya Osome Tamoto no Shirashibori), written in 1711, is generally considered the basis for what became an enduring world (sekai) in Tokugawa period drama concerning these tragic lovers." There is a wonderful Osaka diptych by Shigeharu in the Lyon Collection (#586) which shows Hisamatsu in one panel and Osome in the other. "Chikamatsu Hanji's (1725-1783) The Balladeer's New Tale (Shinpan Utazaimon), from which Nozaki Village is derived, was first performed as a puppet play in the ninth month of 1780; its initial kabuki performance was in 1808. The scene translated here remains one of the most popular in this particular world for both the puppet and kabuki theaters. The Japanese title of Hanji's drama, Shinpan Utazaimon (literally, 'a newly published ballad') refers to the story's notoriety as a song told by wandering minstrels. Hanji grafted onto the rather simple tale of a lovers' suicide a convoluted plot involving a missing sword, a man seeking to restore his birthright, and sundry thieves and villains. In Hanji's version, Hisamatsu's real father is a samurai who is forced to commit suicide when he loses his master's sword. The peasant Kyūsaku, the brother of Hisamatsu's wet-nurse, takes in the boy. Hisamatsu is subsequently apprenticed to the Aburaya pawnshop in Osaka, where he falls in love with the employer's daughter, Osome." The quotes shown above are taken from volume 2 of Kabuki Plays on Stage: Villainy and Vengeance, 1773-1799, edited by Brandon and Leiter, p.108. Against a glittering gold mica background, a profile portrait of the actor Jitsukawa Enjaku III (実川延若) in the role of Kyūsaku (百姓久作)in the play Nozakimura (野崎村). Numbered 86 (八十六), printed in the upper left in black ink, from a limited edition of 90. Printed on Tori no Ko ganpi using Magnolia obovata woodblocks. Self printed by the artist.